On Thursday, all of NBC's entertainment programs pushed liberal environmental themes, but "30 Rock" -- a satirical take on the inner workings of NBC -- was the pushiest, featuring a scene in which Al Gore suggested to fictional NBC executive Jack Donaghy (Alec Baldwin) that the network go green for a week (as NBC has done in real life). "If your network really wants to demonstrate a commitment to the environment, why don't you start by, for example, having an entire week with nothing but environmental themes on all the programs," Gore recommended. "Use entertainment for substance. You could have a character in prime time making a passionate argument to the American people that we need CO2 taxes to replace the payroll taxes. Your parent company could lobby congress and the President to pass the treaty and save the climate." In the show, Gore's appearance followed that of "Greenzo," a business-friendly environmental advocate cooked up by NBC executives (played by David Schwimmer). After Greenzo lets the fame of "saving" the environment go to his head and the network is unable to control him, Donaghy tries to bring in Gore as Greenzo's replacement. After Gore's preaches his environmental message, he ends the scene by mock-seriously announcing, "Quiet! A whale is in trouble. I have to go." 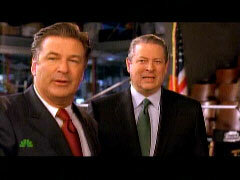 Al Gore: "Hey, Jack, good to see you again." Jack Donaghy: "Mr. Vice President. Hi, how are you?" Liz Lemon (Tina Fey): "I'm Lemon." Gore: "So I'm excited to see this trash-powered car of yours." Lemon: "How do you two even know each other? Gore: "We met when Jack was an intern for Senator Ted Kennedy. Let me tell ya, Jack was the most liberal guy-"
Donaghy, interrupting: "Da, da, da, da, da. The thing is, the G.E. Garbage car isn't quite ready yet. But while you're here, what do you say you throw on a pair of green tights and a cape, and tell the kids how big business is good for the environment?" Gore: "I have no interest in doing that." Donaghy: "Al, we're with you on this whole planet thing. I mean, look at the set we built with the smiley-face earth and some green things." Gore: "Jack, look, we're way beyond that. If your network really wants to demonstrate a commitment to the environment, why don't you start by, for example, having an entire week with nothing but environmental themes on all the programs? Use entertainment for substance. You could have a character in prime time making a passionate argument to the American people that we need CO2 taxes to replace the payroll taxes. Your parent company could lobby congress and the President to pass the treaty and save the climate." Donaghy: "Yes, or... you could put on a silly hat and tell the kids how outsourcing means cheaper toys at Christmas." Gore: "This is not working for me, Jack." Greenzo: "All right, let's do this!" Donaghy: "Jared, what are you doing here?" Greenzo: "Whoa. Al Gore? What's up?" Donaghy: "Ah Jared, it's time for you to go." Greenzo: "No, no! The show must go on! Back off, Jack! Or you'll be Greenzoed! You'll all be Greenzoed!" Lemon: "I--I am so sorry, Mr. Vice President. This all started when Jack..."
Gore: [Whispering] "Quiet! A whale is in trouble. I have to go."